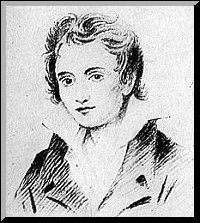 Percy Bysshe Shelley (1792-1822), poet, atheist, nobleman and exile, was an early champion of Keats’s work. They were introduced by Leigh Hunt, whose politics were already alienating Keats. Interestingly, Shelley was critical of Hunt’s influence upon Keats’s work; he believed Keats to be a natural talent led astray by mannerisms and affectation. Upon learning of Keats’s illness, Shelley graciously asked him to stay with his family in Italy. The poet politely refused. Shelley wrote the beautiful elegy Adonais upon Keats’s death. The next year, Shelley himself drowned; a volume of Keats’s poetry was found in his pocket. This interesting letter is a reply to Shelley’s literary advice and kind offer of his home in Italy for Keats’s recuperation.